This will be a review of Banyan Botanicals’ Mental Clarity tablets. According to the manufacturer, this product is meant to improve certain cognitive traits such as focus, memory, and concentration. The supplement is primarily made for people such as students or those who need a boost to retain the information they learn. Keep reading this review to learn more about this product and its claims. This product also contains: silicone dioxide and organic maltodextrin. It does not contain soy, gluten, or dairy and is deemed both vegan and vegetarian friendly. This product is also USDA organic, which is ideal for those who are looking for a more natural and less processed supplement. It is suggested you take 1 to 2 tablets one or twice daily, unless otherwise directed by your doctor. You should always speak with your doctor before taking any sort of dietary supplement. It is highly recommended you consult your doctor if you are a woman who is nursing or pregnant, if you are taking prescription medications or if you have an existing medical condition. The price for one bottle is $19.95. However, the more you purchase, the lower the price. If you decide to purchase 4 bottles it will come out to $17.96 which will save you 10 percent. There is also the option of purchasing a case of 12 bottles which will run you $215.46. There is currently no mention of auto billing or an auto renewal option. The company has a 90 day return policy. There are no limitations or restrictions when it comes to the policy. They only require you to contact customer service so you can be issued a RMA or Return Merchandise Authorization code to be written on your package. You will be refunded your full amount less the shipping cost. There are two reviews on the products page. Both are generally positive; however, with just two reviews, it really doesn’t tell us much about whether or not the product works for a group of people. 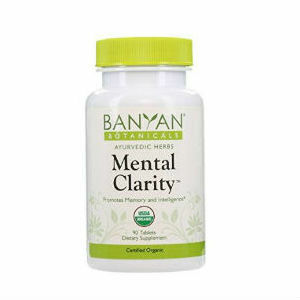 Banyan Botanicals Mental Clarity tablets seem to be a relatively solid product. Not only is it vegetarian and vegan friendly, it is reasonably priced as well. Many people may also enjoy the fact this product is USDA organic and also not filled with filler ingredients. The return policy is a standard policy, though they do not specifically state if the product has to be returned unused. It would be best for you to ask the manufacturer specific questions like these about a possible return before you make the purchase. Another thing that does not support the product is the lack of customer reviews. For many new customers, they rely on the overall consensus of what others have said and their experiences with it, so to not have that information readily available can be a determining factor for this product. Overall, it seems like a product with solid ingredients, price, and also a bit of customer support. Henry Costa	reviewed Banyan Botanicals Mental Clarity	on November 20th	 and gave it a rating of 3.5.